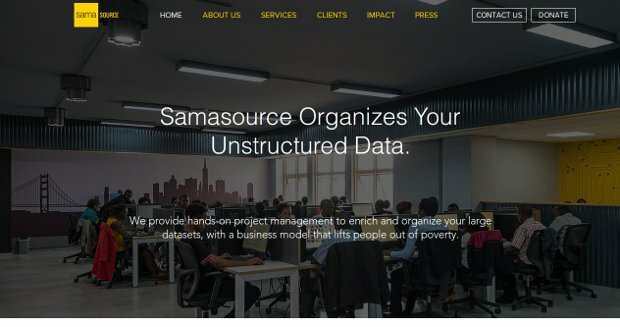 At Samasource, they’ve found that even the most complex projects are composed of small tasks that can be performed by anyone with basic computer skills. Their Microwork model breaks down large data projects and identifies smaller tasks that can be simplified and distributed to workers through their innovative technology platform, the SamaHUB. The SamaHUB also helps project managers train team members to become subject matter experts in your chosen field so they can complete each task with the highest degree of quality and accuracy. Impact sourcing would be the way to take outsourced digital work and give it to people living in poverty in underdeveloped regions around the world. For many, this is the first time they’ve had access to formal job training and work experience. Impact sourcing allows people to earn a living wage and to establish a dignified life for themselves and their dependents.